The Ladies' Guide to Surviving Anypocalypse: Apocalypse Now? Honestly, I’m not really the white dress and harp kind of girl. My tastes are more colorful. I like my music a bit more vibrant. However, I don’t really relish the idea of Hell either. Color abounds, but it’s mostly red or shades thereof. Plus, I don’t tolerate the heat all that well. Since it seems more or less inescapable, the Rapture isn’t really my concern. I’m going to end up where I end up and I’ll make the best of it either way. 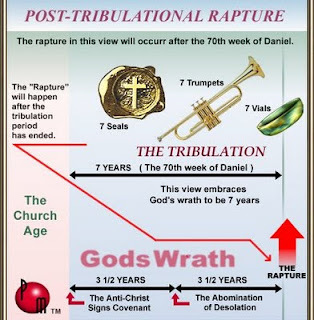 What I am concerned with is the seven years before the Rapture: the Tribulation. I don’t think Mr. Camping has done his math correctly (again) since the Tribulation supposedly precedes the Rapture by seven years. And it is full of nastiness. Sadly, it’s not the kind of nastiness you’ll find on Skinemax. and the spreading of the Jesus’s message. The possibility that we have been living the Tribulation and didn’t realize it seems slim. Have there been lots of natural disasters? Certainly. Have people been adversely affected? I’ll not dignify that question with a response. Is this the beginning of the End Times? I suppose it’s possible, but if it is, frankly, I’m disappointed. Nations have been rising against each other for thousands of years. Earthquakes have been happening since there has been an Earth to quake. Famine and pestilence are the norm in several parts of the world. We could look at the arrival of false prophets, but they have been around since before Christ. People renounce religion every day; and they aren’t all Christians. Christians are persecuted, but so are people of other religions and belief systems: like other signs, this depends on where in the world you look. People have been spreading their interpretations of Jesus’s message since he sent those first disciples out into the world. So, how does one survive and apocalypse of Biblical proportions? If we had backpacks that threw electricity, we could cross the streams. But we don’t. The Tribulation sounds like a world in disarray. Perhaps working together to set things right will do more to stave off the End Times than any other tactic. Instead of trying to save ourselves, maybe the answer in this case is to save each other. Send relief to victims of natural disasters. Send food to those in need home and abroad. Teach preventive measures for disease control and supply life saving medicines where needed. Do not listen to those who would have you hate your fellow people because of their color, creed, religion, or orientation. These are the true false prophets: the people who would have you believe that God doesn’t love every creature He has made. When one door closes, another opens. Religious renunciation could be the correct path for some. That last bullet – spread the message of Jesus – is tricky. Last I knew, His message was to love thy neighbor, practice forgiveness, turn the other cheek, help each other, and generally be groovy. I certainly wouldn’t want to discourage anyone from spreading a message like that. So maybe it’s not the message that’s the issue, but how it’s spread. Avoid fear mongering. A person cannot be forced into Enlightenment. Just gotta get a tune up on the truck and we will be all set. The whore of babylon needs a chariot and if she is gonna be happy SO AM I.
Jesus was a total hippie; people screw it all up, though. He..."told them to be groovy, hang out, drink a bit of wine... they split into different groups...ya got the Catholic, the protestants, the Jesuits, the methodists, the evangelicals, the free presbyterians, the locked up presbyterians, the Quakers, the Bakers, the Candlestick Makers - the Mormons *are* from Mars..."
Jesus was Batman...no, that's Bruce Wayne. He was a hippie. And one with super powers: that's the best kind of hippie. Imagine how easy surviving the apocalypse would be if you could catch one fish and feed your entire survival group? I guess we are all here and well. That's good. Keep doing your part to prevent the Tribulation and the Rapture!